Looking for a hearty dish to make around the campfire? 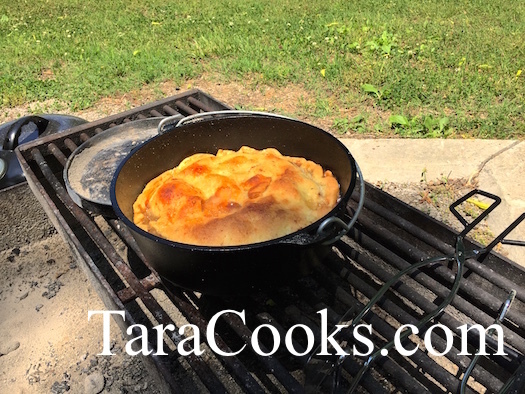 Dutch Oven Apple Pie is a people pleasing way to keep all your campers happy. This one turned out perfect and was simple to make with store bought pie pastry and some apple pie filling with fresh apples added. Light 25 charcoal bricks and assemble the apple pie while waiting for charcoal to heat and turn grey. Allow pie crusts to warm to room temperature out of the cooler for 10-15 minutes. Unroll on of the refrigerated pie pastries and line the bottom of a 10″ Dutch oven with one of them, pressing the edges up onto the sides of oven. In a large bowl add the apple pie filling, sliced fresh apples, sugar, and cinnamon. Pour mixture into Dutch oven. Dot the apple filling mixture with the butter cubes. Pour water over the filling. Top the mixture with the other pie crust sheet. Press edges to the sides and into the other pie crust. Sprinkle a little sugar and cinnamon over the top pie crust. Cover Dutch oven with lid and place over prepared charcoals. Place 8 hot charcoals under the Dutch Oven and 17 hot charcoals on top of the lid. Every 15 minutes rotate Dutch oven 1/4 turn clockwise, then rotate the lid 1/4 turn counterclockwise. Cook Apple Pie approximately 40 minutes or until crust is golden brown and filling is bubbly. Remove from heat and cool slightly before serving. This recipe is a keeper! It is a crowder pleaser and is so easy to make – just brown beef, open cans, add cooked noodles and enjoy. In large Dutch oven brown the ground beef. Add bullion cubes, water (or beef broth) and tomatoes. Bring to boil and dissolve bullion cubes in liquid. Add salt and pepper to suit your taste buds. Reduce heat to simmer at 20-30 minutes. While the beef, broth, and tomatoes are simmering, prepare 1 cup of dry pasta spirals according to package directions. Cook until al dente, drain, and rinse with cold water. Add cooked noodles to soup mixture before serving and let simmer another 5 minutes. 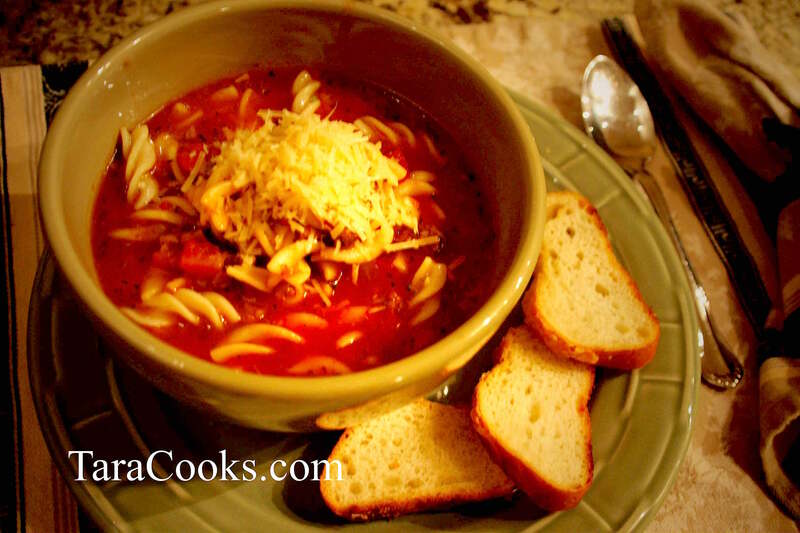 Serve with fresh grated parmesan cheese. I spent a good part of Tuesday “degreasing” and organizing my cook top and drawers under it. It was a messy sticky icky job. One of the tasks involved with this project was organizing the spice drawer. I’ve had jars and boxes of spices thrown into this drawer for a decade. The spices would spill out into the drawer, and were in no order whatsoever. Part of my spices were stored in this drawer and the rest in another drawer on the other side of the kitchen. Locating a spice wasn’t easy and left me frustrated. Solution? 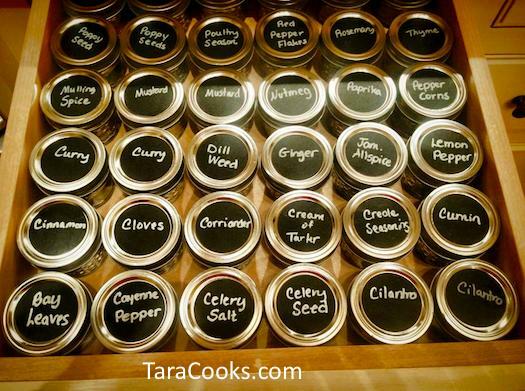 36 Ball jars, 4 oz size, filled with spices, stored neatly and clearly labeled with CHALKY TALKY chalkboard peel and stick labels. I ordered these labels and the CHALKY TALKY liquid chalkboard pens from Amazon. The cool thing about the labels is the liquid chalk can be wiped off with a damp paper towel and reused. There were 40 labels which fit standard size jars. I plan to order another pack of 40 standard labels along with wide mouth labels for another organization project. For now, I am one happy happy OCD gal! 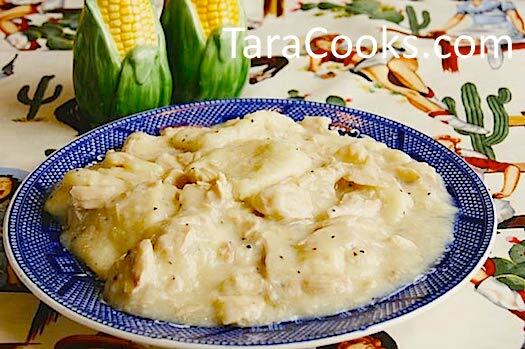 I can think of few main dishes with more Southern flair than Chicken and Dumplings. I do not recall either of my parents making this dish in our home. Chicken and Dumplings were given the respect they deserved. Only my Grandmothers were worthy enough to make them. There was no special family recipe written down. And both my Grandmothers instinctively knew how to prepare this family favorite. By the way – the Blue WIllow plate in this photo belonged to my great grandmother Hancock. I think the secret to perfect Chicken and Dumplings is having rich chicken broth. Although boneless, skinless chicken breast could be cooked and diced, a whole hen with the skin on will produce a richer broth with more fat. Short on time? Pickup a deli chicken and boil it for a few minutes skin and all before shredding the chicken meat. Save the broth to make the dumplins. Remove any bagged chicken pieces or parts from the cavity of the hen. Rinse her well. Fill a large deep pot halfway with water. Add the chicken and bring water to a boil. Reduce heat to medium or a low boil. Cook chicken until tender. Remove chicken from broth. SAVE BROTH in pan to cook dumplings. When chicken is cool, pull meat from bones, removing skin if desired. Mix together and add enough milk to make a stiff batter. Knead dough using plenty of flour. Roll out to the thickness of pie crust. I use a pizza cutter to cut dough into 1 inch by 2 inch pieces. Bring chicken broth to a rolling boil. Drop dough pieces into boiling broth and cook slowly until done. You may need to cover pot with a lid and allow the excess liquid to cook down. Add chicken and let stand to blend the flavors. Add salt and pepper to taste. Serve hot! Fried chicken is better when made from fresh, not frozen chicken. Remove fresh chicken tenders from package (I’ve also used the chicken breast and cut my own tenders). Rinse chicken and place in a bowl of water along with 2-3 Tablespoons salt. Soak chicken 30-60 minutes. Pour water off chicken and rinse again. Return chicken to bowl and cover with buttermilk. Let chicken soak in buttermilk at least 30 minutes. Place chicken in refrigerator while soaking in salt water and buttermilk. While chicken soaks, prepare the breading. Crush the crackers, and then add the flour, all the seasonings, mixing well. Sometimes, I will place the breading in a zip-lock bag to coat the chicken. Sometimes I simply toss chicken with the breading in a large bowl. Either way, the some of the buttermilk needs to be drained off the chicken before the breading takes place. Also, place only 4-6 tenders at a time in the breading. Too many tenders at once are harder to coat. I like to lay the breaded tenders on paper towels as I continue breading and begin frying. I use a fryer that has a metal basket, along with a thermostat. I fill the fryer up to the maximum oil line. Then I preheat the fryer to 400 degrees. When oil is hot, I add 4-6 tenders to the basket and fry for about 6 minutes, or until the breading is golden brown, but not overdone. If the tenders are very thick, I like to cut into the thickest ones to test for doneness. Sometimes the tenders must be fried a little longer. Remember, pink chicken is not very healthy. 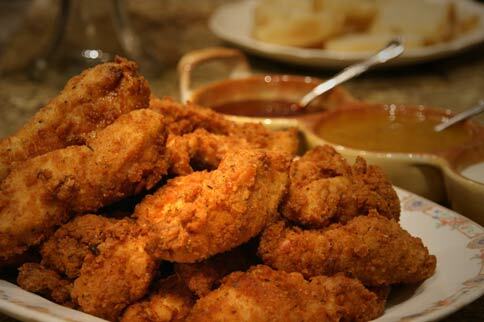 Remove cooked tenders from fryer basket and drain/cool them on clean paper towels. Transfer to your favorite platter when all tenders are ready to serve. See this platter – it belonged to my husband’s grandmother. My mother-in-law gave it to me for Christmas this year. This was the first meal served on it in our home. Our children love all types of dipping sauces. These tenders are excellent served with Jezebel sauce. Other favorites are honey mustard dressing, ranch dressing, and barbeque sauce. You will make many friends when you serve these tenders. What in the world is Jezebel sauce? Well- its zippy, its zesty, and its zingy! And it peps up a lot of fried meats and boring dried beans. Mix well, cover, and refrigerate until ready to use. Serve as a dipping sauce for fried chicken, shrimp, or fish. This sauce is also tasty served with pinto beans, navy beans, crowder peas, or black eyed peas. Keeps up to 4 weeks in refrigerator. Do you need a recipe for all that leftover Christmas ham? 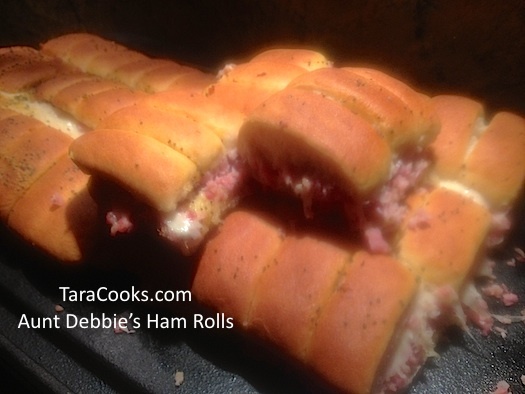 Make my Aunt Debbie’s Ham Rolls. This recipe can be made ahead, refrigerated, and baked for breakfast. It can be easily put together for a quick snack, party appetizer, picnic, or even a Super Bowl item. To make good use of any leftover ham, cut it off the bone and place it in a food processor. Lightly pulse until ham is chopped into fine pieces. If chopped ham is not to be used right away, fill Zip-Lock bags with 2 cup portions and freeze them. Use frozen ham later to make ham salad, or this recipe. Mix the melted butter, mustard, Worchestershire, poppy seeds, and onion powder together in a small bowl. Using a serrated knife, cut each pan of rolls through the middle lengthwise and remove the top half and set aside. Place the bottom half back in the foil pan. Brush the bottom halves with the melted butter mixture. Put one cup of chopped ham on each lower half, then add 1 cup of Swiss cheese to each pan. Place top halves back on and brush tops of rolls with any remaining butter mixture. Bake in 350 degree preheated oven for 20-30 minutes or until tops of rolls are golden brown and cheese is melted. These cookies were served to guests of the annual Lebanon Historic Tour of Homes this year. 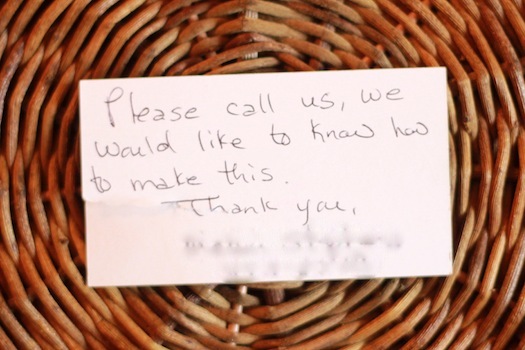 One guest returned to grab all but one cookie, mentioning the cookies were the best she had ever tasted. I didn’t really think that could be possible. Thankfully one cookie was left, and I was next in line. I took it. I tasted it. And I loved it. Yes these are just about the tastiest cookies I’ve ever eaten. Thankfully I was able to secure the recipe for family and fans. In a large mixing bowl combine the butter, sugar, egg, and vanilla. Cream well with a mixer. Add the flour, baking soda, and baking powder to a sifter. Sift and combine the flour mixture with the butter mixture. 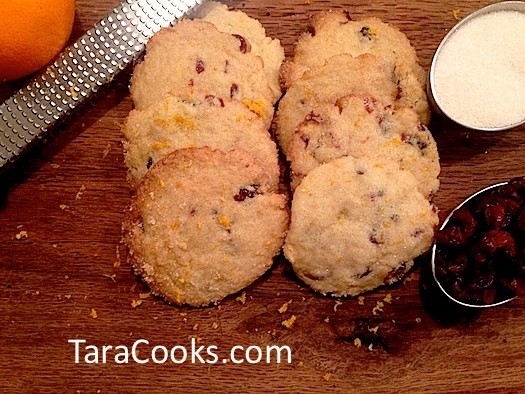 Fold the chopped cranberries and the orange zest into the flour/butter mixture. Stir to combine. Form 1″ balls with cookie dough. Then roll the balls into the 1/2 cup sugar and extra orange zest. Place on ungreased cookie sheet and bake in a 350 degree pre-heated oven for 7-11 minutes, until cookies are lightly browned. I like to lightly flatten each cookie with a spatula before they cool for a softer center. Pulse all ingredients until cranberries and onions are finely chopped, but not pureed. Pour salsa into a large bowl, cover and place in refrigerator at least 4 hours. While salsa is chilling, let 2 8 oz packages of cream cheese set on counter to soften. 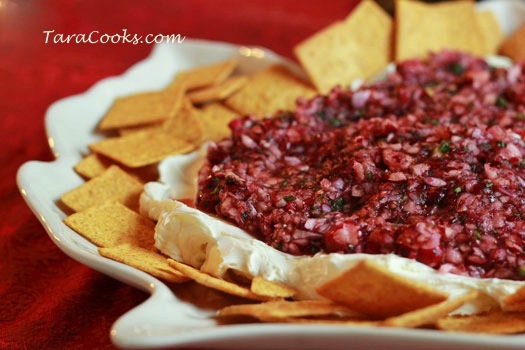 Spread cream cheese over a pretty plate or dish, then top with the salsa. Serve with pita chips, Wheat Thins, or Triscuits. Refrigerate leftovers IF there are any leftover! 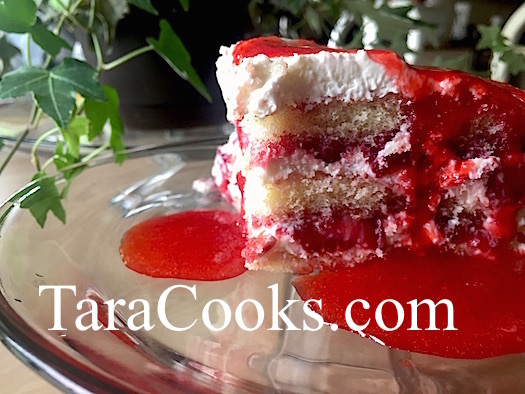 You are going to have to try this recipe to believe how moist and tart and tangy and tantalizing the taste is. And this bread is so festive and can be made into 2 regular size loaves or 6 mini loaves – either size suitable for gift giving at Christmas time. Use Bob’s Gluten Free Baking Mix for a Gluten Free bread or just use plain flour if you prefer. 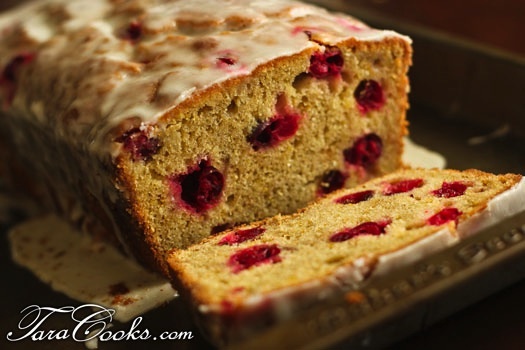 I think this recipe was originally in Sunset Magazine but I’ve adapted here just a bit by using fresh instead of dried cranberries and gluten free baking mix. Preheat oven to 330°. Butter two 6-cup-capacity loaf pans (or, if making the mini loaves, butter six 2-cup-capacity pans). With an electric or standing mixer on medium speed, cream butter and sugar together in a large bowl until pale and fluffy, about 3 minutes. Add eggs one at a time, mixing well after each. 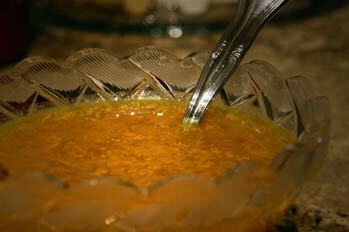 Add orange juice, sour cream, orange zest, and vanilla; mix until blended. In a separate bowl, whisk together flour, baking powder, and salt. Add flour mixture and cranberries to wet ingredients and mix just until dry ingredients are absorbed; do not overmix.Pour batter into prepared loaf pans. Bake until a toothpick inserted in centers of breads comes out clean, 70 to 75 minutes for large loaves and 60 minutes for mini loaves. Meanwhile, in a small bowl, whisk together powdered sugar and 7 tbsp. Grand Marnier. Glaze should have consistency of thick maple syrup or corn syrup. If it is too thick, thin with an additional tbsp. of liqueur. Let loaves cool in pans for 10 minutes, then remove and transfer to a cooling rack set over a large baking sheet. With a thin skewer or long toothpick, poke deep holes in tops of loaves. Drizzle with Grand Marnier glaze so that it coats the top, runs down the sides, and seeps through the holes. Let loaves cool completely, then slice. Refrigerate or freeze leftover bread.